As the morning alarms filled our respective rooms at 4.30am on 1st October 2016 collectively we knew it was time to get up, get ready and face the challenge! Last month our CCA Scotland team embarked on our primary voyage in the name of charity. We climbed Scafell Pike – the highest peak in England and the 3rd highest in the UK in the name of Charity. 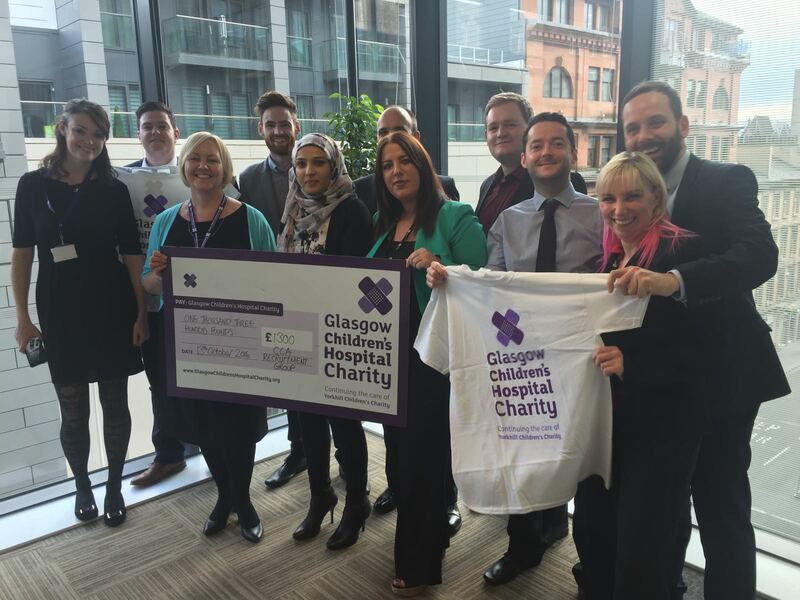 For our Glasgow team we know we have a corporate and social responsibility to give something back to our wonderful city and there were a few charities on the shortlist before we reached a decision. It was evident though that Glasgow Children’s Hospital Charity was a clear winner by unanimous decision when it came to the vote. The tireless work the charity team and medical professionals who belong to the hospital continue to do year-on-year has become part of the fabric of Glasgow. This is a charity which some of our would-be ramblers hold very dearly for the love shown to family members. The three hour drive down to the lake district that Saturday morning – individually dressed as though we were seasoned professional mountaineers – was spirited and the excitement and anxiety became palpable as we seen the formidable peaks of Scafell Pike on the scenic winding roads leading up to our “base camp”. The climb itself was tough going and on more than a few occasions we individually had to diminish the threats of quitting in our own heads as well as vocally to each other. The cause we were supporting certainly played a big part in getting us up that mountain and we kept going and going until we eventually summited over three hours and 978 metres later. Overall we raised £1,300 for Glasgow Children’s Hospital Charity and we were tremendously proud as a team to welcome Julie-Ann Webster from the charity to present us with our cheque. Our CCA colleagues in Manchester who joined us for the Pike Hike also raised £605 for Manchester Dogs Home. Collectively we raised £1,905 for our local charities with the Scafell climb! This takes our overall CCA total to £2,634.19 so far for charity following CCA Manchester scaling Snowdon earlier this year…a number we are committed to increasing in coming years! The next challenge for our CCA team is Ben Nevis! We will hopefully be attempting this in summer 2017 and we will keep you all posted in the build up!